I reviewed this recently and enjoyed it as well. I also highly recommend his previous book which was also published by Seagull. The writing style is very similar. I remember that review, Melissa. I think there are three others currently available from Seagull. Which one did you read? I read Against Nature. My first Espedal and it’s what brings me back to anything new that is translated from him. Espedal is one of a small handful of contemporary writers I consider a touchstone. All of his translated works are very worth seeking out. I believe your responses to his work first put him on my radar. I will definitely seek out more. I very much like his Against Art and look forward to this book, after your review. I think I’d like this better than Knausgaard! K depresses me. I’ve only read the first one and that was more than enough, and now I think of people wading through its successors at the expense of so many other wonderful books, so many hours of reading time gone forever… It’s narcissism gone mad, IMO. I am a Knausgaard fan, but you make this sound really appealing, Joe. (And surely one can have both.) I have Against Nature to get to first but will put Bergeners on the list. I don’t think Espedal would mind. They are friends and I believe they have been known to appear in one another’s work. Their books are similar in intent but completely different in style and approach. Thanks for this book review. 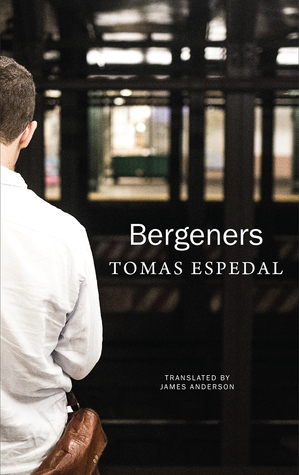 Unfortunately, the novel “Bergeners” does not appear in German until autumn. I first got to know Espedal through the novel “Tramp”, then I read “Against Art” and “Against Nature”. Recently published in German his first works “Biografi, Dagbok, Brev / Biography, Diary, Letters.” In these texts you will find the beginnings and themes of Tomas Espedal. I think you can love both Espedal and Knausgaard at the same time – like me. No doubt – and Knausgaard has already said that himself – Espedal is the greater stylist. Thank you for your comment and for the links. I recently watched them myself. And I do know people who love both Knausgaard and Espedal, but my instincts align much more closely with the spare, mixed form the latter employs. I will definitely read more. Seagull has an office and distribution network in London so UK availability should be no problem. Ooooh – well , I may well check it out! I thought this book was wonderful, and you capture the reasons why perfectly in your review. It reminds me of looking into an artist’s sketchbook, filled with hurried sketches and half finished ideas – the skeletons on which he/she will hang their work. I definitely need to read more Espedal. I bought this at Seagull’s store in Calcutta. It seems to me they had all of his other translated titles on hand. I kind of wish I’d bought at least one more but, well, one can only carry so much home! I think I must have been a miserable Norwegian in a past life as this is really calling to me. Another one added to the list! It’s one of those books that I like more and more as time passes, and now I’m quite keen to read more. ‘He bemoans his losses; he knows well that he is wallowing.’ – and yet, he makes a fine book of that! Wallowing in style. A thing to learn, for me. Thanks for the review Joe. Makes a good book to pick up next. I did think of our conversations as I read this. It is a lovely, unusual book.